Fun ways to decorate the outside of your home and yard for Halloween -- so you'll be in the running for the scariest house in the neighborhood this year. Even if you don't win the award, you can bet your house will be one of the most noticed this Halloween season! DIY Halloween prop builders paradise awaits! Tricks and tips to scare the wits out of trick-or-treaters. If they survive the trick, they get the treat! Here is a unique Halloween yard decoration to be sure. Give it a go yourself or just enjoy the fun! Gathering scary ideas for decorating your home for Halloween has never been easier. Nothing here will cost you an arm and a leg…or anything for that matter…just a little bit of your time. Here’s a Top 10 Halloween costume list as chosen by a typical, adventurous 11 year-old boy. Who better to ask? Halloween costume ideas abound in this post about Edde’s Trick Shop in Marietta, GA with additional ideas from BuyCostume.com. Both have a wide selection and will ship to your door. Looking for some scary Halloween lawn decorations and ideas for your house? I’ve compiled some links to some ghoulish ideas and some of the BEST online retailers. 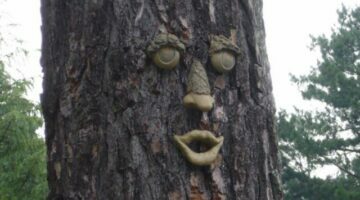 Tree faces are becoming a unique accent in landscaping these days… with good reason. Some of them are so life-like that if you were to adorn your property with a few of them you would have a whole bunch creating a virtual woods of forest faces.